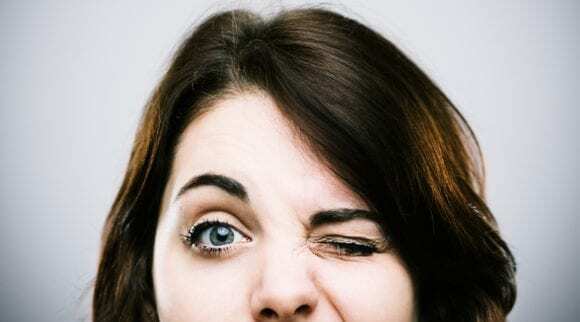 An itchy eyelid that is swollen occurs when excess fluid builds up in connective tissues around the eye. Itchy eyelids that are swollen can be painful. It may also affect either the lower or upper eyelids, or both. While several different reasons may contribute to swollen eyelids, the most common is allergies. 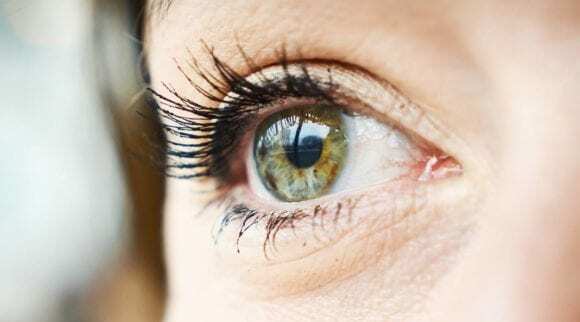 Though, swelling of one’s eyelids may indicate a more troubling health issue or disease, like Graves’ disease, orbital cellulitis, or ocular herpes. It is crucial to see an eye doctor if such issues persist. Eye allergies occur when a foreign object interferes with your eye or eyelid. Dust, pet hair, pollen, dander, and contact lenses can all cause issues with one’s eyelids. Makeup that causes allergic reactions is also a potential danger. Conjunctivitis is otherwise known as inflammation of the lining on the surface of the eye. This results in swollen itchy eyelids, much of the time. The eyes will turn red, and may be itchy and watery. Styes usually appear as swollen, reddish bumps near an edge of one or both eyelids. Styes occur when bacterial infections contribute to inflammation of the Meibomian glands. Blepharitis is inflammation of the eyelids that is caused by malfunctioning of the oil glands in the eyelids near the base of one’s eyelashes. Blepharitis is a chronic condition and symptoms can be controlled with certain hygiene practices and cleaning solutions. Some of the symptoms of swollen eyelids include: irritation of the eyes (i.e. 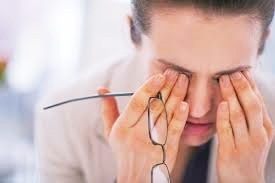 scratchy sensation), sensitivity to light, tear excess that creates watery eyes, eyelids with visible redness, vision that is blurred, red eyes created by the inflammation from the conjunctiva, eyelid flaking or dryness, eye discharge, and pain in the eyelids. Swollen, itchy eyes are an irritating and sometimes persistent problem. 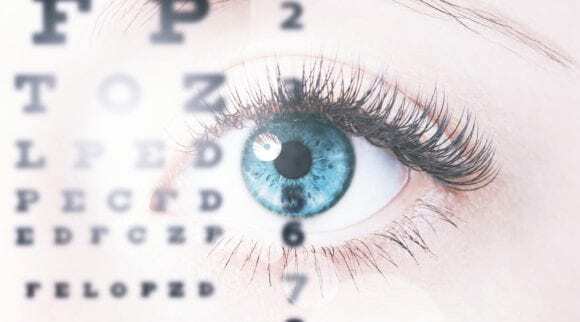 When your vision is impaired, everything else (even the most basic daily functions) may seem like a hassle. Reading or looking at a computer screen might be impossible. Walking or running may be a hazard, let alone even considering driving. And when your day to day routine is impacted in a negative way, so is your mental state, which could contribute to increased anxiety and depression. The good news is there are several fantastic remedies available, many of which are affordable and/or all natural. Formulated to combat styes, blepharitis, dry eyes, and more, this product soothes dry peepers. This cleanser kills all microorganisms in its path by using a broad-spectrum microbial effect which neutralizes inflammation and prevents biofilm from forming. Heyedrate prides itself on giving its customers the gift of tremendous vision and promises that their product may be used for itchy eyelids, eyes, and skin. This product is organic— it is alcohol and fragrance free, and it contains zero preservatives. The application of the product is simple and can be efficiently done; just clean the area of any debris or makeup and spray the solution onto the spot. Gently rub the solution in (or let it dry). There is no need to rinse this product off. Repeat throughout the day for best results. The solution is fast-acting, letting you get on with your busy day! Heyedrate’s mission is simple— they believe that everyone deserves great vision, so for every product sold, they are giving a portion of the profits to someone in need of eye care. Eye Love was launched in May of 2015 with the intent of building clinics in areas that lack sufficient eye care. The company is also an active member of the iCARE project as well as Great Shape, Inc. They visit Jamaica each year in order to provide free eye exams as well as hand out eye glasses and sunglasses to those in need. The purpose of the philanthropic work is to inform customers that they should feel inspired by what Eye Love is doing to help make the world a better place. Eye Love believes that not only can it be done at the local level, but also internationally. Filled with pleasant essential oils such as coconut oil and tea tree oil, these cleansing eyelid wipes moisturize and soothe any swollen, itchy eyelids. Some eyelid wipes leave a burning sensation on the user’s eyes, but not these. Made in the United States of America and rigorously inspected by the Food and Drug Administration, these wipes are safe and reliable. 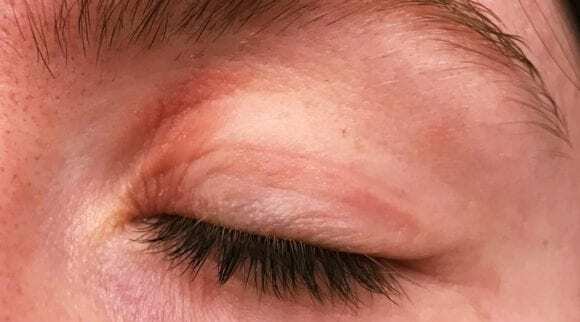 This itchy eyelids treatment is a popular reliever for anyone experiencing irritated, swollen, dry, and/or red eyelids. 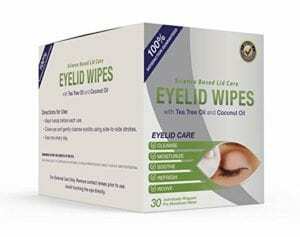 You’ll be able to maintain proper ocular hygiene and health and give your itchy eyelids relief by regularly cleaning with these eyelid wipes infused with tea tree and coconut oil. These wipes are also a great option when attempting to remove your makeup; the wipes can be carried around with you in a purse or bag, and will leave you without any burning sensation, pain, or eyelid irritation. To use them effectively, simply use around intended areas to take care of all debris, oils, dirt, and more! 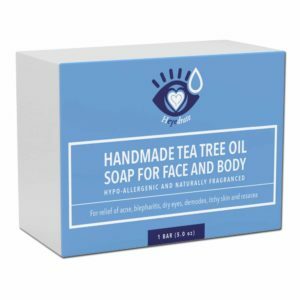 Made specifically for the support of skin plagued by demodex, blepharitis, itchy skin, acne, dry eyes, and rosacea, this product is handmade in the United States with five all-natural ingredients: organic green tea, organic olive oil, organic coconut oil, raw shea butter, and tea tree essential oil. Tea tree oil neutralizes inflammation, kills off any microorganisms, and stops the reproduction of demodex eyelash mites. This soap can be used anywhere; lather your face with lukewarm water and this soap. Massage it into your pores through circular motions, rinse well, and pat dry. Repeat the process twice a day, or as needed to cleanse away what could make your eyelids swollen and itchy. Love is put into each 5-ounce bar. The bars include locally sourced ingredients that are mixed together in Newberry, South Carolina…by hand! 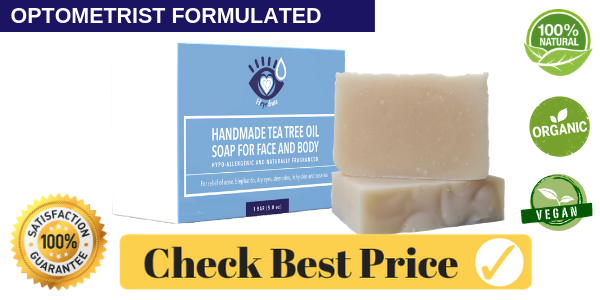 The method of processing the bars in cold temperatures as well as the genuine care that is put into each bar result in a product that will last for an extended period of time. 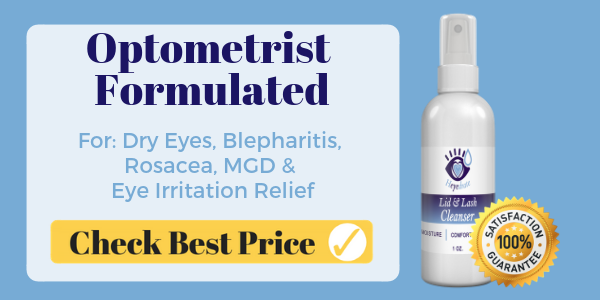 If you’ve been suffering from swollen, itchy eyes or blepharitis, this natural cleanser from We Love Eyes may be perfect for you. The foaming cleanser is 100% organic and all-natural. The tea tree oil that is infused within the cleanser attacks bacteria and demodex mites; no more red, itchy, irritated, swollen eyelids! 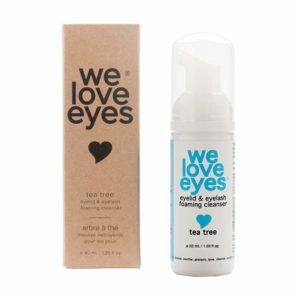 Have peace of mind knowing that your symptoms will be soothed by this tea tree foaming cleanser from We Love Eyes. This product is safe to use on eyelids that have lash extensions on them as well. The cleanser attacks dirt, makeup, debris, and other causes of an itchy eyelid— all while being supremely gently on your precious eyelids. 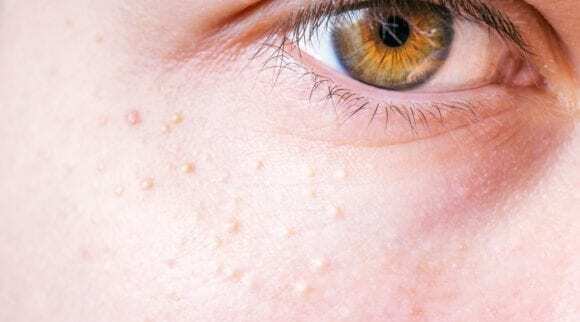 You will not have to worry about your lash extensions (which you spent hard-earned dollars on) getting damaged by this tea tree eyelid foaming cleanser. Other products use harmful chemicals that can just lead to even puffier, more swollen eyelids. 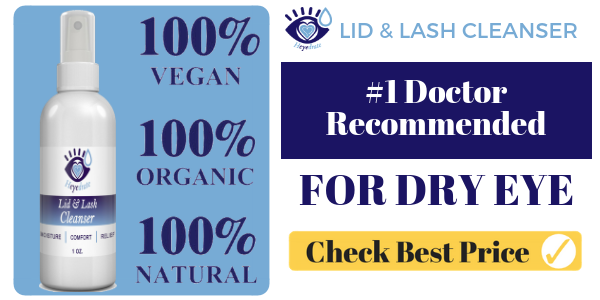 This eyelid relief cleanser has no paragons, no chemicals, no alcohols, no artificial colors, and zero fragrances. Made solely in the USA, We Love Eyes has responsibly crafted a trusted cleanser. Looking for something eco-friendly, organic, vegan, and completely natural? This .02% hypocholorous soothing spray from Curativa Bay provides relief for itchy eyelids, swollen eyelids, red eyes, acne, and rosacea. Simply follow these steps: 1) Clean your skin thoroughly; 2) Shake the Curative Bay bottle lightly; 3) Spray the solution directly onto skin and leave until dry or at least thirty seconds; 4) Rinsing is not required. Air pat dry and reapply throughout the day as desired! The .02% hypochlorous pure organic cleanser is available in a variety of sizes (even travel-sized for flying). Get relief from conditions like rosacea, skin irritations, eyelid inflammation, swollen eyelids, adult acne, sunburn, and more. This product assists your skin’s natural defenses! It is organic, vegan, hypo-allergenic, alcohol free, and without preservatives. 1. Get tested for allergies. If swollen eyelids and other symptoms of allergies are a regular occurrence, get yourself allergy tested. By knowing what you’re allergic to, you can try to avoid specific allergens or, at the very least, minimize your exposure to them. 2. Choose makeup and other beauty products that are hypoallergenic and fragrance-free to help avoid allergic flare-ups. You can also do a patch test on the inside of your wrist before using the makeup on your face to rule out any allergic reaction. 3. 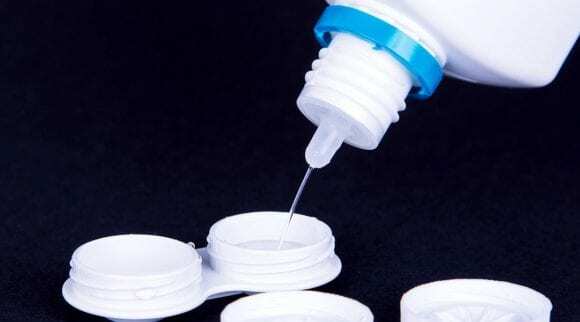 When using eye drops, look for preservative-free eye drops. While preservatives in regular eye drops inhibit bacterial growth, some people are allergic to these preservatives. 4. If you wear contact lenses, you can minimize your risk of eye infection or irritation by practicing proper hygiene techniques, including frequent replacement of your contact lenses and contact lens case. 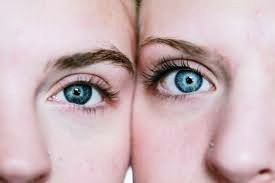 Even better, try daily disposable lenses! Proper diagnosis of eyelid inflammation is crucial. Patients should always make sure they consult a qualified professional such as an eye doctor to get help for itchy eyelids. The physical exam by your eye doctor generally consists of using a specialized magnification tool to study the eye for any inflammation. The doctor will also check for the presence of bacteria or fungi, as well as any other viruses that may be present. If an infection is suspected, the doctor will then swab an eye in order to use the sample for specialized observation under a microscope. Swollen, itchy eyelids can ruin anyone’s day. 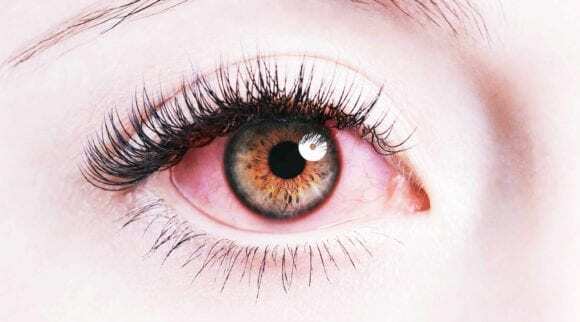 Sometimes allergies are to blame for making your eyelid swollen and itchy; the changing seasons often lead to uncomfortable alterations of our sinuses. Watery, red eyes may also be a sign of a bacterial or viral issue. Seek medical treatment if the issue persists or worsens.